The stories of Goldilocks and the Three Bears, Hansel and Gretel, and The Three Little Pigs have withstood the test of time entertaining generation after generation from one country to the next. Now Storytime Toys brings these time honored childhood classics to the next generation in a brand new way. 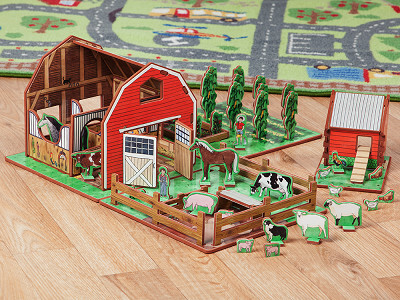 Storytime Toys are richly imagined, artfully designed books and playhouses in one. Made of lightweight EVA foam and high quality card stock, the houses fit together like a 3-D puzzle and fold flat in a portable carrying case conveniently designed to fit on your bookshelf. Assembling the houses and furniture is as easy as pressing tabs into place. No tools or screws required. It’s so simple—it really is child’s play. Founded by Mechanical Engineer and Mom Kara Dyer, Storytime Toys creates toys that promote imaginative play and encourage literacy. The artist responsible for the beautifully painted artwork that makes each house and its characters so captivating is RISD trained Art Director, Sara Argue. 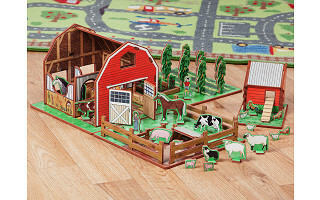 Safe, environmentally friendly, and battery free, Storytime Toys bring new meaning to the phrase happily ever after. When the book ends, the story is just beginning. Hi Everyone! For my daughter Mae's third birthday, I couldn't wait to buy her a dollhouse. I think that they are wonderful toys that allow children to role play and develop their imaginations. But, I was disappointed by the options I found on the market. Either the dollhouses were cheap and low-quality, easy for a three-year-old to break, or they were big, expensive and elaborate, taking up a ton of space. That’s why I decided to create a a line of dollhouses that provided a happy medium between the two extremes. And as a product designer, I knew that I wanted to add features to make each one special. Together with my close friend and artist, Sara Argue, we crafted enchanting toy houses that are based on classic fairy tales - each one is special - and designed with a lot of care and attention to detail. I would love to see some Bible stories as well for those of us who share these stories with our children and grandchildren. Thanks for the suggestion. Kara is open to new ideas for the future. Attn Grommet, Sylvia posted a question in the reviews for the Goldilocks house - may want to reply and let her know she needs to use the comment board for future! Kara, can you explain further about the 100% recyclable notation in the product description? I saw EVA foam on the description in the Storytime Toys page but was assuming foam would not be recyclable. Would appreciate your enlightenment. Thank you! @Emily Thank you for your question! I am sure that this is a bit dependent on where you live and what your recycling center will allow. Recycled EVA is now being used for the production of many consumer goods, particularly for shoes! Thanks for letting us know about the question in the review, Emily. We'll get right on that. I love these! What a marvelous idea that was well executed! I just sent an e-mail to several friends of mine with little-children and little grand children. The response was very favorable! @steve Thank you so much! We loved designing them, we love seeing children play with them and can't wait to make more! They are beautiful! I hope you do make more and sell a zillion of them! I love the thoughtfulness behind the construction and detail in the art work. Also, the idea of including a story book that encourages parent-child play time is just wonderful. Keep up the great work! 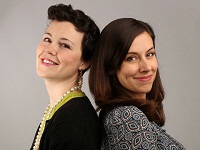 Do you have information about who the author(s) is(are)? @Judy These classic fairytales were re-told by Kimberly Duncan-Mooney. Kimberly has many years of experience as an editor for children's books and has her MFA in Creative Writing from the University of Massachusetts Boston. She wrote these versions of the story so that the language, sentence structure and themes are appropriate for the 3-6 year old age group (i.e. Hansel and Gretel is not nearly as dark and scary as the original version!). @Kara Thanks for the follow-up! WHAT AGE DO U RECOMEND? @JEFFERY These toys are best for children ages 3-6. And they are not for children under the age of 3 because there are small parts! Please include appropriate age ranges for any and all toys (and such) on your website. of these items for children. Thanks. I only ordered a couple of days ago and my "houses" arrived today. Thank you!!! I'm not sure who I am going to 'gift' them to yet, but am tempted to put one together myself and have it ready for little visitors. I agree with the comment below - I'd love to see some bible stories. Please tell me the size and weight of the box. I would love to send it to my granddaughter but must mail it out of the country and the extra expense and packing is a consideration in everything I buy for her. The stories of Goldilocks and the Three Bears, Hansel and Gretel, and The Three Little Pigs have withstood the test of time entertaining generation after generation from one country to the next. Now Storytime Toys brings these time honored childhood classics to the next generation in a brand new way. 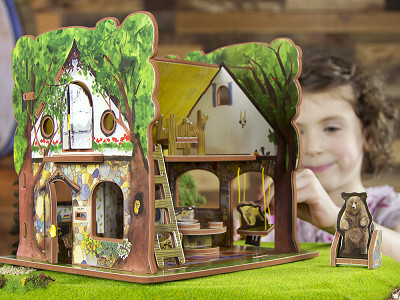 Storytime Toys are richly imagined, artfully designed books and playhouses in one. 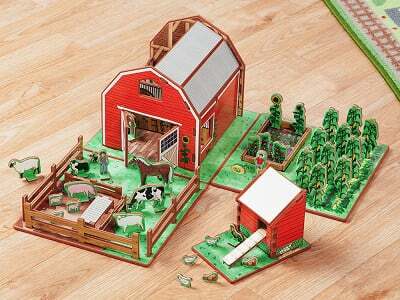 Made of lightweight EVA foam and high quality card stock, the houses fit together like a 3-D puzzle and fold flat in a portable carrying case conveniently designed to fit on your bookshelf. Assembling the houses and furniture is as easy as pressing tabs into place. No tools or screws required. It’s so simple—it really is child’s play. Founded by Mechanical Engineer and Mom Kara Dyer, Storytime Toys creates toys that promote imaginative play and encourage literacy. The artist responsible for the beautifully painted artwork that makes each house and its characters so captivating is RISD trained Art Director, Sara Argue.